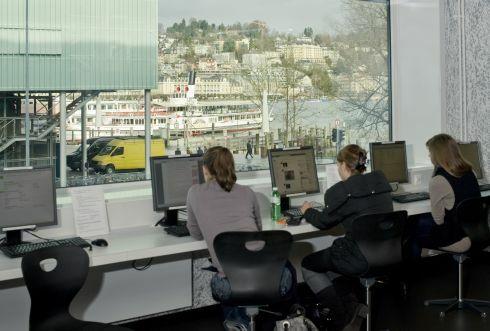 The Central and University Library, Lucerne (ZHB): One library – three locations. 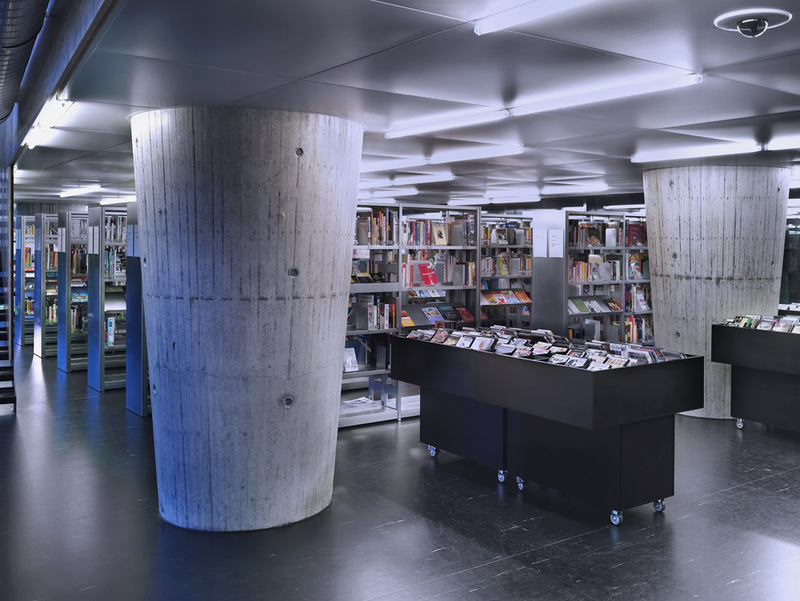 The largest library in central Switzerland has been collecting and disseminating information since 1951, for research and teaching, study and work, and leisure and entertainment. Today, the ZHB meets the diverse needs of its users at three different locations, each with its own distinct profile. All three branches are centrally located close to the main station and can be reached on foot in just a few minutes. The most beautiful park in Lucerne is a centrally located oasis, and in the middle is the heritage-listed main building of the Central and University Library. 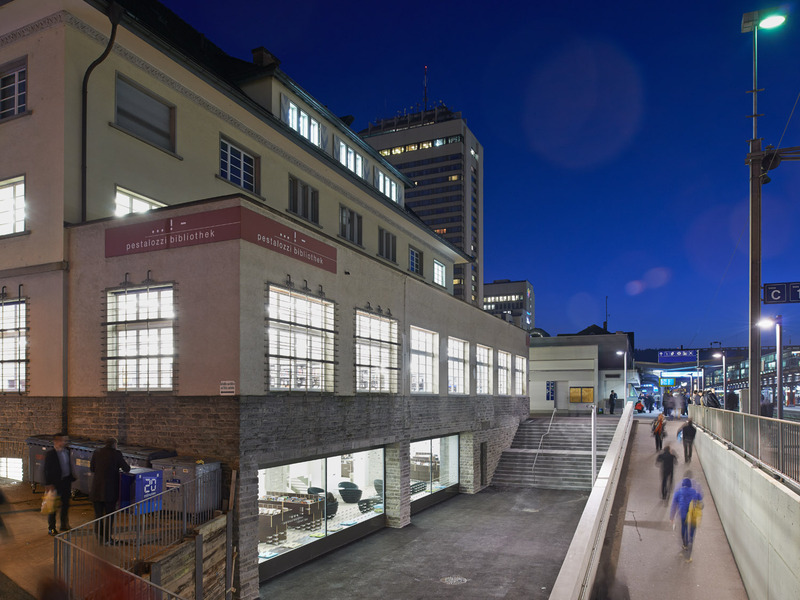 Built in 1951 to plans by the Swiss architect Otto Dreyer, the building has survived the decades remarkably well, including the major developments necessary to house a modern library operation. Nevertheless, the upcoming and long-overdue renovation is keenly anticipated. The library in the park is an ideal place for reading, learning and working, viewing exhibitions, attending events, and exchanging ideas with others. The services here are tailored particularly to the needs of the general public. There is a wide range of fiction and non-fiction materials available, including books, newspapers, magazines, pictures, sound recordings, audio books and electronic media. The valuable historical collections include manuscripts and rare books, musical works and an extensive photo archive. Resources and facilities: In addition to about 1.3 million items available from the closed stacks, there are approximately 20,000 volumes in open access, to browse on the shelves. There are also reading rooms, group and individual workspaces, a modern infrastructure, a lounge for reading newspapers and magazines, and an exhibition and event area. The other major branch of ZHB in the Uni / PH Building is also ideally located, right next to the station and just two minutes from the lake. Those who get a window seat can enjoy the stunning views from the 5,500 square meter library. 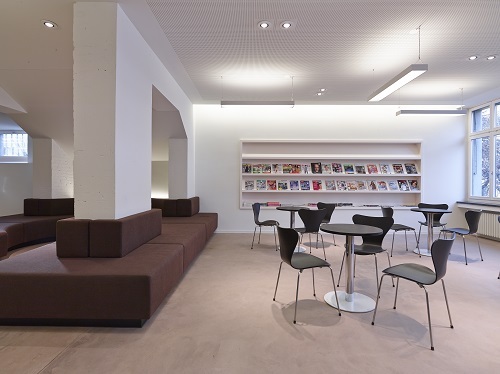 All other users of the library, opened in 2011, benefit from one of the remaining 700 workplaces. The highly valued and frequently used library focuses on the needs of students and staff of the University itself and the University of Teacher Education (PH). About 300,000 volumes of the most recent literature can be found on the shelves of the extensive open access area, above all relating to the subjects taught at the two institutions. These include, in particular, academic journals, reference books, source collections, introduction and background material, as well as research literature. Resources and facilities: In addition to about 1.3 million items also available here from the closed stacks, there are approximately 300,000 volumes in open access. 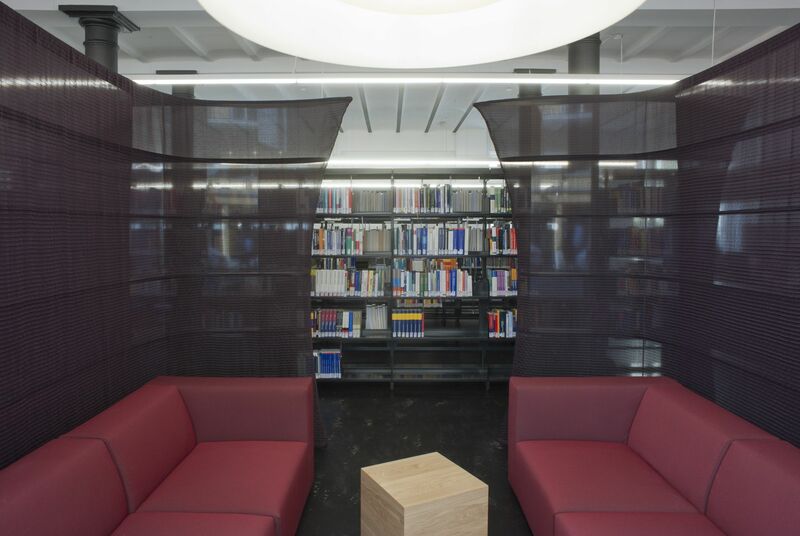 There are also various reading rooms, 700 group and individual workspaces, a modern infrastructure, and a large, generously proportioned lounge. 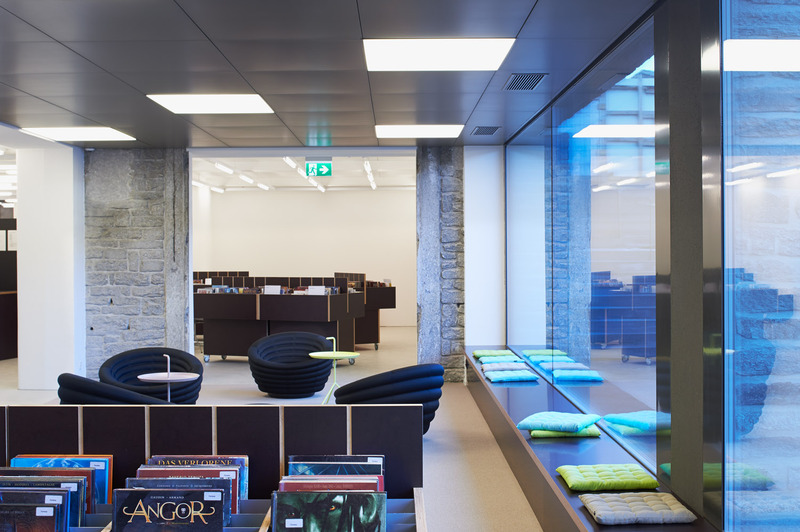 In the ensemble of ZHB libraries, this library plays a key role for students and staff of the Lucerne School of Business. 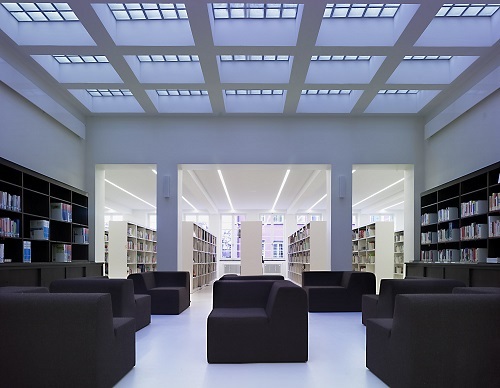 The ZHB provides library services for the School under contract, and offers here, as at each location, attractive workspaces and modern infrastructure, the most current literature, as well as expert, service-oriented advice and assistance. Resources and facilities: In addition to about 1.3 million items available here as elsewhere from the closed stacks, there are approximately 15,000 volumes, including around 90 academic journals, with introduction and background material in the areas of economics, business and management, the main teaching focus of the School. There are also 90 workspaces in various configurations for individuals and groups, as well as a modern infrastructure. The largest part oft the ZHB collection is preserved in a closed magazine. 2016 this collection will remove to an inter-cantonal storage. 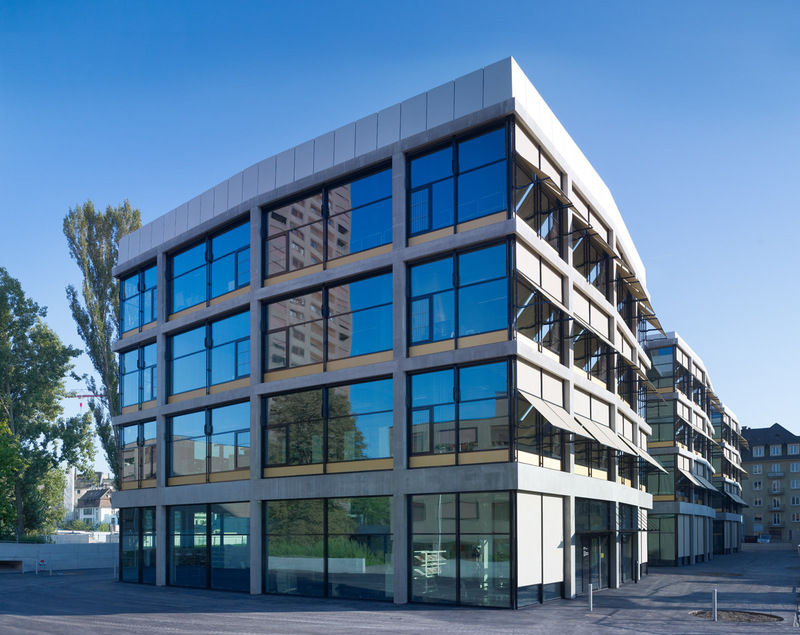 The modular extendable storage is located near Lucerne. 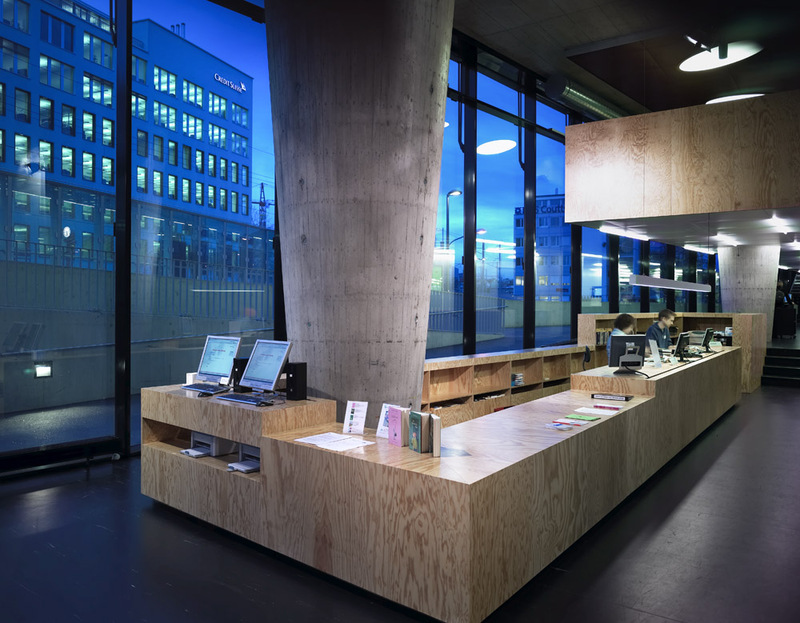 It will retain the collections of several large libraries of five swissgerman cantons. The magazine is first planned for three million volumes. When needed the capacity can be expanded to 18 million volumes. 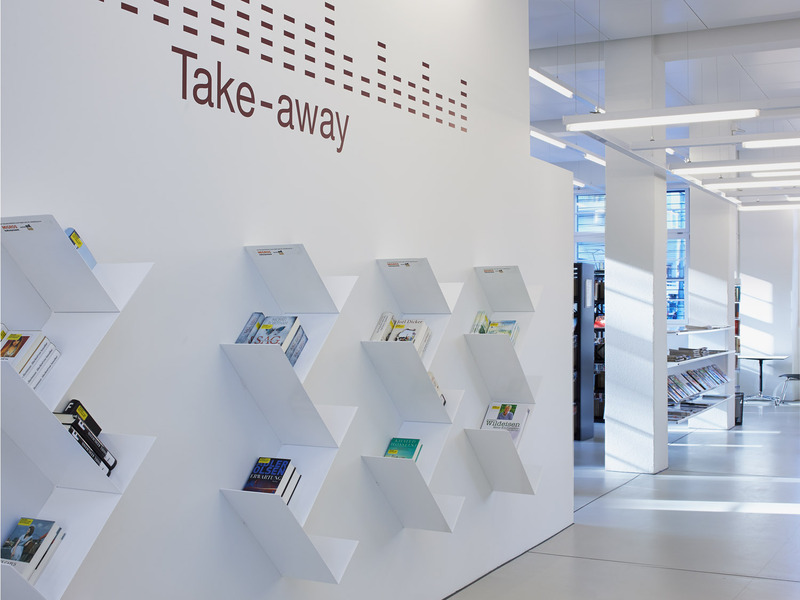 The library is incorporated into a large new shopping centre and office building complex. The building has direct access to public transport incl. rail link (The Zürich S-Bahn). 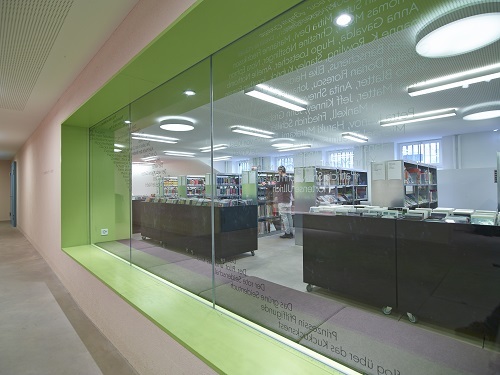 The large window offers you an insight into the library before you have even stepped in. The display though is not books, but the readers sitting immersed in a novel or a comic book in the window aisles. Those are taken over by kids and young people in the afternoon, when they are off school. While the toddlers are found with their noses buried in a picture book on the large bright sofa sculpture, the young seem to prefer the 28 meters long settee in the sheltered seating area: Seeing and being seen is just as important as the object of lecture itself. As for the adults, they enjoy the relaxed atmosphere in the reading bistro and the lounge with the large selection of magazines or do simply have a chat with old friends. 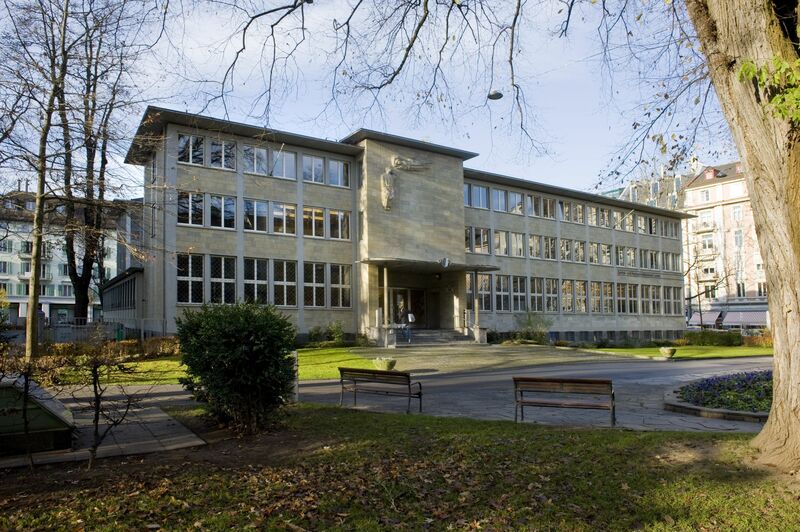 Back in 1933, the premises were set up as a reading room of the then so called Pestalozzi-Society. At the time, it was considered luxury to have somewhere warm to sit and read. The bleak information desk and the wooden chairs were the very embodiment of reading culture. While in the digital age we find this changed, the PBZ libraries remain an institution that is continuously trying to meet specific needs of local library users in the best possible way. Thus, children can easily visit the library and check out items on their own. The easy wheelchair access is estimated by those with disabilities and the friendly staff will help anybody who seeks their assistance. The rooms with their now modern and vivid colours can barely be recognised from before and regular customers are stunned. In order to gain more space, an old utility room has been converted into an original lounge. Pillars have been integrated in the concept in a congenial way. Some areas have been decorated with a specific item of furniture without making any concessions to the modern expectations in matters of design. The many custom-built interior items were well worth the effort. The number of visitors has more than doubled since the library has been reopened. The once quiet afternoons of the parish community building are done and over with. Whoever has just finished their lesson at the musical school next door can go by the library for a quick browse. Mothers whose kids are at playschool are taking some refreshment in the reading bistro, children are running down the aisle in order to fling themselves unto the big red sofa at the end of it. And those who are in a hurry and do not have time for any of that can cast a lingering eye through the window glass -with the good intentions of having more time on their hands when they return. 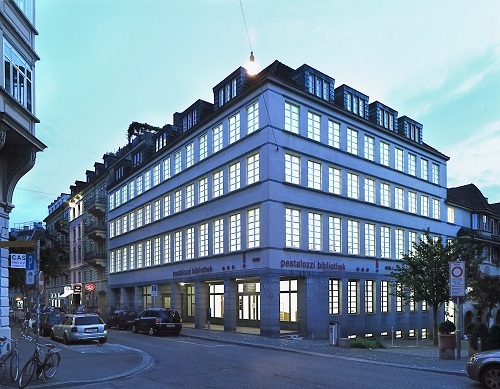 PBZ PESTALOZZI-BIBLIOTHEK ZÜRICH HARDAU, Switzerland. The library premises are integrated into a newly built public school building. 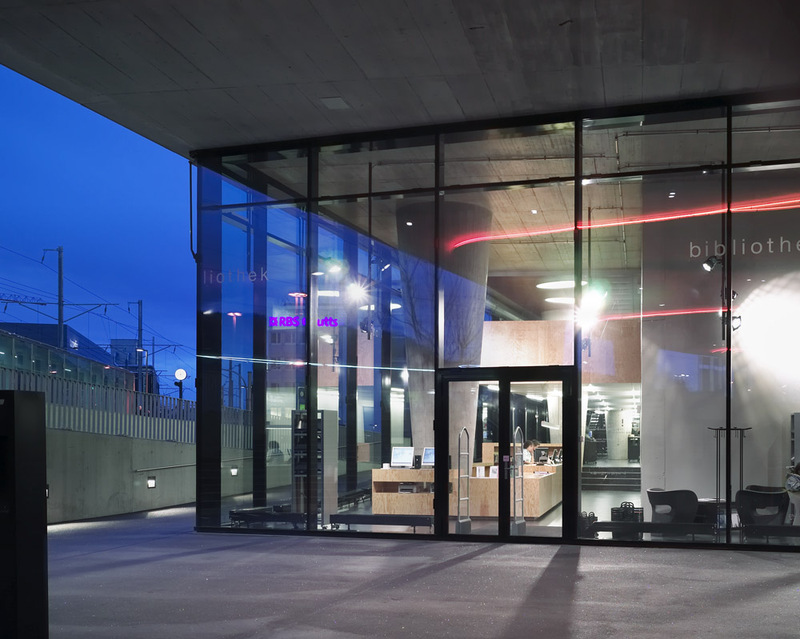 The building is in compliance with the Swiss minergie standards (Minergie Building). This is a label for energy consumption (Swiss sustainability brand for buildings with low energy consumption). It functions as a combined district and public school library. Run by a multicultural team. Wide selection of items in 12 languages. Focusing on intercultural relations and integration work. Thus providing and organizing various courses and events. Particularly strong in offering comprehensive family literacy programs. Many events are taking place for foreign speaking parents and their children in order to achieve proficiency in their native language.